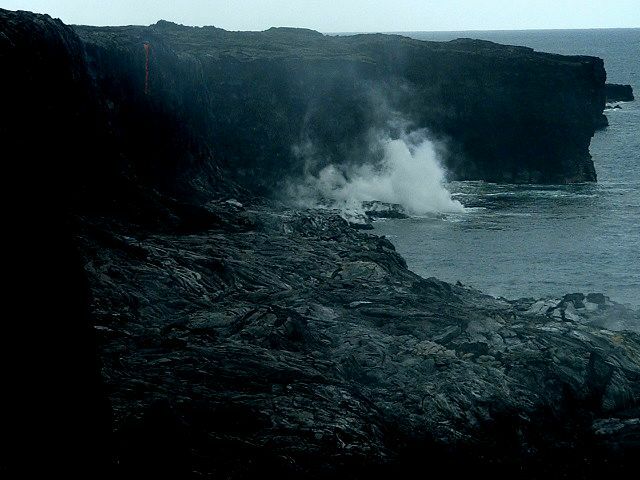 JoeDuck's World has moved CLICK HERE: Kilauea Lava Falls are ... cool. 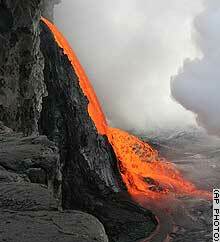 Recently Kilauea on the island of Hawaii created a spectacular (Dec 2005) lava fall .... cool, and I was there in April. 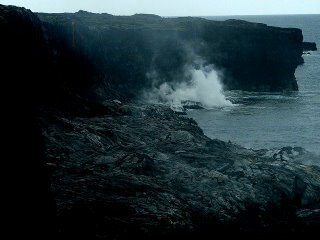 I'd wanted to see lava up close since Geology classes at UW Madison but this was my first trip to Hawaii. Lucky because they closed the area I was walking around in June due to the danger of ... what wound up happening. the very cliff that fell away in early December: My picture (below) of the area is far less dramatic but I did get to see a "small" but still awesome lava fall in the distance - you can make it out as a tiny stream off the cliff to left in my picture (below) though it was probably about 1-2 feet in diameter. The new falls is about 6 feet in diameter and already busy extending the Hawaiian shoreline. For more of my lava pix click here.